All Boring homes currently listed for sale in Boring as of 04/25/2019 are shown below. You can change the search criteria at any time by pressing the 'Change Search' button below. If you have any questions or you would like more information about any Boring homes for sale or other Boring real estate, please contact us and one of our knowledgeable Boring REALTORS® would be pleased to assist you. "9 tax lots that make up this amazing 63+Ac property. EFU land with county and LUCS approval for tier 2 cannabis production on each of the tax lots. Two of the lots are zoned residential and have homes of little or no value but have power, water and septic. The property has been surveyed, it has 2 shared wells with water to each of the 9 tax lots. Fantastic gently sloped property with pastoral and Mt. Hood views." "Quality throughout this 5900 sq ft hm from its Gourmet Kitchen (Benihana Grill inc), Elevator to 1500 sq ft bedroom suite/full bath; Sound System throughout, Instant Hot Water, Custom Cabinets , 4 fireplaces, Home Comfort zonal heat, 2 vacuum systems; LED lighting;.3rd & 4th lrg bedrooms currently used for other purposes - 4800 sq. ft shop/garage/ RV hookups & dump 5.57 acres/tractor & mower; Generator - Priced at $200 per sq. ft"
"OPEN SUN APRIL 28th 2-4PM Main level living on park-like 1.39 acres w/2 upper lvl bonus rms! Fabulous new kitchen opens to great room w/gas fireplace. New carpeting in most rooms! High ceilings thru-out! Over-sized 3-car attached garage + 50x40 finished/heated shop w/full bath can house 6+ cars + 2 exterior covered RV parking spaces. Family rm and Master Bedroom open to large covered patio and beautifully lighted fenced yard w/gazebo." "Stunning, custom one-level home, on 5 Acres! Soaring ceilings w/ floor to ceiling stone fireplace. Abundance of natural light inclusive of 8 skylights, gourmet island kitchen, & bamboo floors. Huge master suite must be experienced. Detached Hobby shop-sauna w/ full bath (ADU/in-law suite potential). Manicured grounds w/ sprinklers on private well. 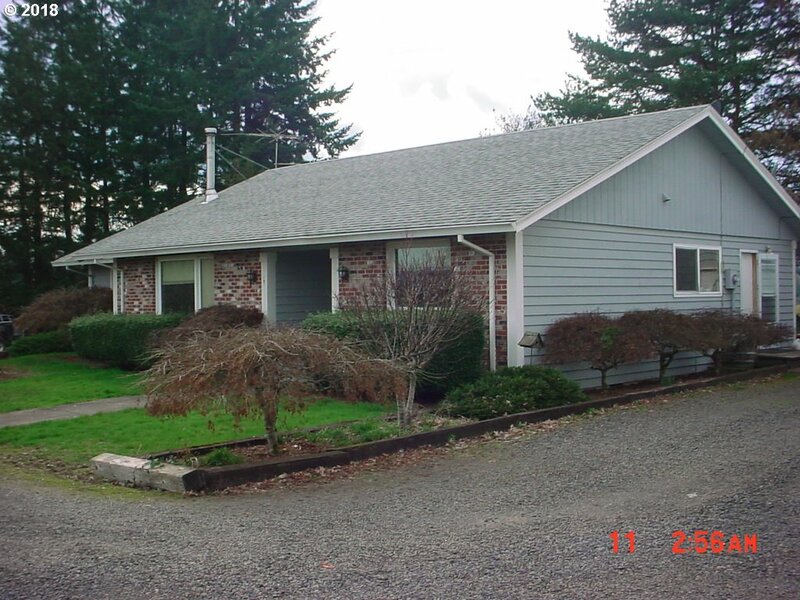 10 mins to Damascus/Gresham, 15 mins to Happy Valley Cross Roads, & 25 mins to PDX!" 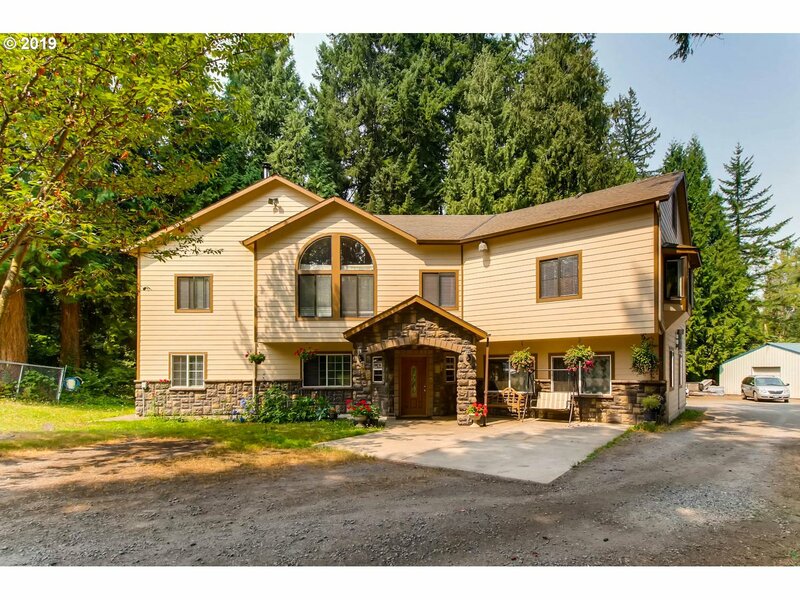 "Nestled off a private lane in Clear Hills you will find a one of a kind 4bed,3bath, 2906sqft contemporary home on 5 acres. Highlights includ soaring vaulted ceilings,sauna, open kitchen w/granite counter-tops & island. Breakfast views of the serene backyard with your own private pond. Additional features: heated shop w/60gal vertical air-compressor, enclosed attached tractor shed, seperate two door RV-garage, Christmas tree farm & more!" "New construction, under construction. This is your chance to own a beautiful new home on almost 3 beautiful acres. Home to be similar in design to Mascord plan 1328 with 4 bedrooms, 3 & 1/2 bathrooms, approximately 3100 sqft, 3 car garage all with upscale finishes." "GENTLEMAN FARM WITH SHARED WATER RIGHTS FROM AG WELL THE GROUND IS RENTED TILL 10/30/2019 TO LOCAL FARMER. THE ACCESSORY BUILDING HAS LIMITED COMMERCIAL USE VESTED BY CLACKAMAS COUNTY LAND USE FROM A M37 APPLICATION. COMMERCIAL SIGNS NOT INCLUDED IN SALE AND ARE RETAINED BY SELLER SUBJECT TO A MASTER LEASE AND EASEMENT FOR MAINETANCE. CALL LA FOR DETAILS." "Mid Century Ranch Beautiful Park like setting with large pond. Home has been beautifully taken care of. 30 x 50 shop with electric. Daylight ranch, great for multi-generational family. Large deck that over looks the pond with fountain. EZ access to mountain, walk the the Springwater trail. Open sat march 16th noon to 3PM"
"Incredible Custom set up on 2.16 Acres w/a 1530 Sq Ft MFG Home & 2 Huge Shops. Shop #1 is 44' x 34' & is finished inside with a Kitchen, Bath & 1 Bedroom & could be a Mother in Law Quarters. Shop #2 is 101' x 66' & has a Loft, Bathroom & Professional Spray Painting booth for cars. Black topped Area from Church Rd to Shops & beyond. So much potential here for a variety of uses! See the video tour for inside & outside photos & video." "A beautiful home with lots of potential.Huge Insulated Shop Approx 57Lx40W. Large office and Bonus room.The first level could be made into a mother in law suite. Seller will give $5000 dollar credit for 2nd kitchen. Main living upstairs, kitchen windows/ balcony provides view of year round creek. 2.90 Acres! Private pond offers an island. 10 minutes away from Gresham Station. Gorgeous leveled property." "One story ranch home built on a level lot. Three bedroom, two bath. Large rec room with wet bar. Recent gas furnace. New roof. Two fireplaces. Large deck off dining area. Secluded lot. Shop is ~4000SQ FT with a ~720SQ FT two bedroom, one bath apartment currently rented. Shop includes 3 phase power, furnace, bathroom, and paint booth. Possible business setup." 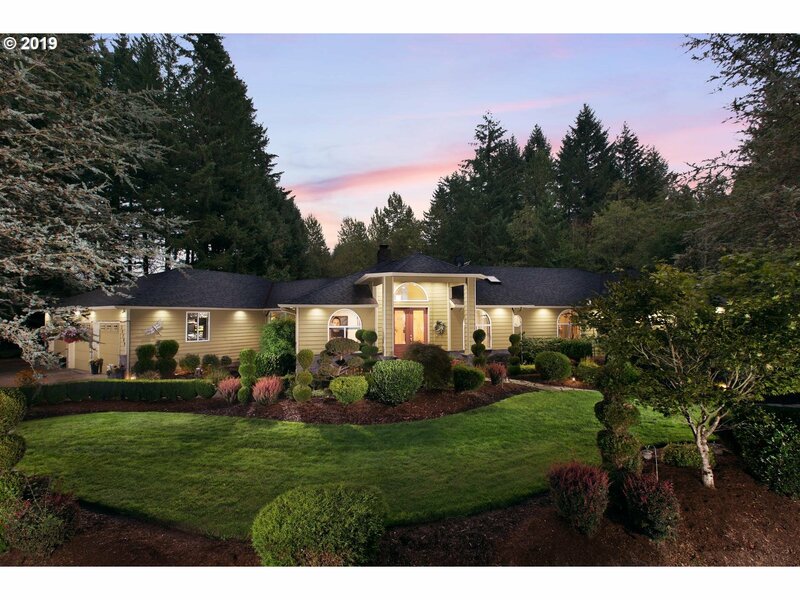 "Custom Contemporary Home with Gorgeous Woodwork on .5 Acre Lot. One Block From Paved Trail, Playground, Park, and Shops! Woodworker's Custom Home. Extensive millwork, cabinetry, and built-ins throughout. High ceilings. Remodeled gourmet kitchen with upgraded appliances, quartz tops. Vaulted Master Suite with Deck, Soak Tub. Four bedrooms up with bonus loft. Updated Cedar Fence, Patio, RV Parking, and Shed. Private Yard on Double Lot!" "Cash only fixer. Seller to do no repairs. There are more rooms that can be considered bedrooms. Basically solid home but does have some dry rot issues. Second little cottage could be man cave or? The ground is amazing, the location is hot and this is priced to sell quickly. Be prepared for clutter inside and out. If there is an appraisal the wood stove will be removed prior to that. It is not certified. Heat pump is out." "Looking for a log home in the woods with modern amenities but close to highway access? Incredibly well built home with many wood amenities, hickory kitchen cabinets and finish work. Kitchen is suitable for a gourmet cook or home based business, granite counters and floors, master on main, luxurious carpet/padding, oversized garage/shop with extra storage attached. Outdoor sink. A solid, gated home in a great area with Barlow schools!" "This home has lots of potential. In process of being cleaned up. New roof (2yrs), newer central air, some electrical upgrades done (not all completed) Property is fenced, has shared well and newer septic tank. Some vinyl windows, Needs work - but very doable. Call for showing." "Huge beautiful triple wide in a country setting! 3 bedroom, 2 bath + front den/office with built-in bookshelves. Huge open kitchen with lots of wood cabinets, black appliances, & breakfast bar. Fireplace in living room & slider to covered wood deck that runs the full 40' width of home. Master bathroom has a nice garden tub with 2 separate vanities on each side & a walk-in shower. This home has been well kept and is in great condition." "Excellent home in enchanting, wooded Big Valley Woods Park. Home is cute, clean ready to move into. Great location, close to park entrance. Nice updates. Laminate floors, newer roof, toilets, covered deck, vinyl windows. Vaulted ceiling. Custom Blinds. Master Bedroom with full bathroom and walk-in closet. Laundry room. Several ponds and protected Geese and Ducks throughout park. Party room facility. Regular pot luck gatherings."